Angel Di Maria admitted "things did not go well at Manchester United" following a £44.3m move to Paris St-Germain, one season into a five-year deal. The Argentina winger, 27, suggested that his family were unhappy in the north-west following an attempted break-in at their Cheshire home. "I'm happy because I know my wife and child will be happy in Paris," he said. "It wasn't just my decision to leave. If I left it was also because they decided to sell me." He added: "The three parties agreed. Me, Manchester United and PSG agreed the deal." Di Maria moved to Old Trafford from Real Madrid in August 2014 for a British record £59.7m. His relationship with manager Louis van Gaal reportedly became strained in the second half of the season as pelvic and hamstring injuries limited his involvement. 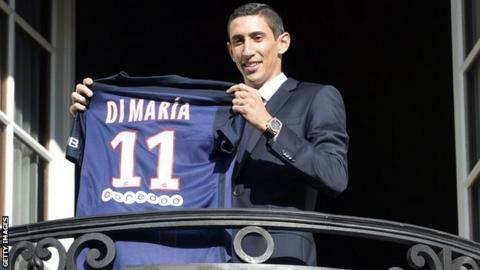 PSG president Nasser Al-Khelaifi said: "I'd like to thank him for choosing PSG. "I know a lot of big clubs were interested because he is a great player. "He's already won the Champions League with Real; I hope he can do it with us." Di Maria was man of the match when Real beat city rivals Atletico to lift their 10th European Cup in 2014.